Bonus points for A: being my go-to brand and B: playing to my other hobbies. 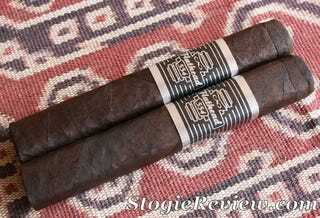 The Camshaft is one of CAO's Flathead cigars, one of four currently available. Also available are V642 Piston, V660 Carb, and V770 Big Block. They are box pressed with a hand-pressed square tip. Like other CAO offerings, the nonstandard shape is one of my favorite draws to the brand. The band - black and silver - is oddly reminiscent of air-cooled head vanes or maybe decorative striping on valve covers. Neat little touch. The wrapper is dark and slightly oily. While I cut mine, I really wish I had punched it. The cut diminished its overall presence. Cold draw I got strong chocolate flavor with just a hint of brandy. Lit draw was a little too much for my tastes but that was my own damn fault. It stayed lit quite well and burned evenly until about 60% through. At that point the flavors transistioned a bit from peaty chocolate and cherry to a more robust and peppery smoke. Not a bad transition, but not one I was really expecting. Reading other reviews seems to agree that cutting this cigar is not the way to go; others that punched did not have unevenness issues or such a dramatic turn in taste and aroma. I thoroughly enjoyed this smoke. I'm glad I left my Anniversary Rocky at home and had to make a stop. It's another winner from CAO and, at seven and change, is quite well worth the price of admission. I took no pics because I was at a party; all pics are courteous of stogiereview.com which also has a good review of this particular smoke. You should check 'em out.